I haven't posted about Retroville in a while, so it's about time for an update! After the tree and other holiday decorations came down, it was time to move in my furniture that had been camping out in my garage. I still haven't finished -- the drapes need to be switched out for some barkcloth ones that I got an an estate sale and hopefully someday the pink carpet will be removed, showcasing the fabulous blonde hardwood floors that is underneath -- but for now I am very please and rather excited to be sitting on my own furniture! Everything in the room that is pictured here was either handed down to me or was bought at estate sales, thrift stores, or flea markets. Here's the backstory on some of my favorite pieces. A few months after I met Jesse, we were at an state sale and I spotted these two love seats at a sale we were at. They had a price tag of $20 and when I went to inquire if that was each or both, the lady stopped me and said I could have BOTH for $15! Now at the time I was still living at home and had no place to put these, but Jesse knew how much I had wanted a set out love seats like this, so he told me to buy them and we could put them at his house until I moved. What a keeper! Plus, how can you beat $15 for both! They do need to be reupholstered, but for now they work. The pillows were found a few months earlier for $5 for the pair at a flea market. Mid summer this past year, I eyed this enclosed bookcase on a sale's listing. I thought for sure it was going to be way out of my price range, but as it ended up, it was $30 -- a bargain if you ask me. I would like to find another one some day to place on the other side of the fireplace. These don't seem to be that rare, as I have seen a few since I purchased this one, although in the wrong color. The fake plants are from the library that Jesse works at. They were going to pitch them, so Jesse brought them home and I ended up with them. I love real plants, but fake plants are nice too! The atomic wall sconces were purchased at an estate sale a while ago for the small sum of $9. I was so giddy when I found these in the attic of the home and clutched them until I was ready to check out. I am currently on the hunt for some gold glittery candles to place in the holders. I may be a bit biased, but I feel this proves that it doesn't have to cost a lot to make your home nice. Pumpkin thinks so too! I think this also goes to show that there still are bargains out there to be found when it comes to vintage pieces. I didn't get all these pieces overnight, but if you are patient, deals are still to be had. 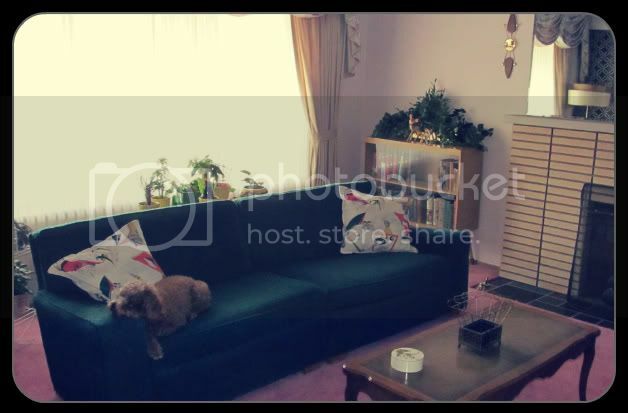 I totally agree with "it doesnt cost a lot to make your home look nice" granted the most exspensive thing in the Den is the $200 pleather couch I got form Biglots, but I was tired of waiting to find a perfect vintage one. Dont you just love how a few good pieces can make a room?! It's funny I just discovered your blog a few months ago, I use to live in Grass Lake Michigan, not to far from you, go figure. Love it-very comfy cozy and most definitely has that vintage feel! I love it. I am trying to go a bit more retro in my decorating (Mary Richard's apartment is my inspiration!). I wish I could afford to just do it outright but I have to live with what I have and change it slowly. The Living room is very nice. When I was a child our living room looked almost like this one (no fireplace). so pretty! i love those pillows especially! hi, I looked at your blog and loved ... I'm following! Hi. I'm a new visitor and follower. Your blog and lounge are just adorable. I struggle to find such deals here in SA but a couple just as whelp were leaving the country I found a part of Johannesburg that I thought only focused on well loved house goods. I look forward to going and foraging since we shipped off all our things when we left. Nice boomarang 50s pillows. Very pretty.